Although I focused on a very specific category of newspaper articles (reaction to the Quebec Act) the twenty-five I studied were only a few of a much larger number of publications. While this does not conflict the validity of my claims or data visualizations, I would need to have examined more articles to establish absolute accuracy. However, I believe that my assertions are broad enough that my collection of articles are strong enough support. In order understand just how polarized European Christendom was at the time, view the N-gram below. However, keep in mind that Google N-gram is a relatively unpredictable tool due to the impossibility of collecting and digitizing all publications from the time period. However, it still serves as an effective method for gauging the overall trends of certain terms. 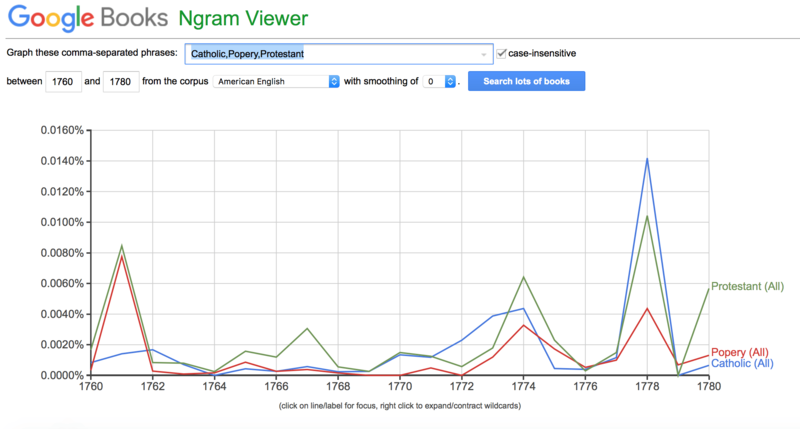 The term protestant was rarely used except as a counter-term to its Roman step-sister. Note the synchronization of the two terms, particularly the use of the term Popery, which was exclusively used in a negative connotation. The spikes in 1761, 1774 and 1778 reflect the reaction to the French and Indian War, Quebec Act and entrance of France into the Revolutionary war, respectively. Parliament grossly underestimated the negative reaction of Protestant Americans to the Quebec Act. The Royal government effectively poured political lighter fluid on Anglo-America’s small, yet growing, revolutionary fire. But what were the specific implications of a Catholic regime in a Catholic-majority province to the remainder of the British-American Empire? Clearly there were more factors fueling this level of paranoia than simply fear of Catholicism’s’ structured hierarchy and theological differences. This is best captured in the word cloud below, notice the prominence of terms such as: “law,” “laws,” “constitution,” “government,” “property” and “parliament.” While the typical theological criticisms of Catholicism, such as: idolatry, host, sacrament, crucifix, and doctrine are all absent. In fact, the only explicitly religious term present is “God,” but it is the same size as the terms, “justice,” “trial,” “tyranny,” ‘rights,” and even “governor.” Also note the complete absence of “Jesus” and “Christ,” a somewhat important figure in Christianity. Another important takeaway from the word cloud is the geographic diversity. Notice the prominence of locations outside of Quebec, Canada, and England. In particular, notice the large status of “Pennsylvania” and “Boston,” and to a lesser extent “Massachusetts,” “Virginia,” and “Bostonian.” This represents the widespread paranoia that the “spirit of the anti-Christ” had yet again infected the British establishment. This conspiracy was easily adopted by both the Calvinist and Evangelical sectors who resented the high-Anglican establishment. Also, keep in mind the Glorious Revolution, which deposed James II and his Catholic Stuart dynasty, occurred within the preceding hundred years. Therefor it was not a stretch for Protestant colonists’ to assume this was the beginning of the Empire’s Romanization. One specific fear that was echoed throughout the eastern seaboard’s newspapers was the possibility of a standing Catholic army. Colonists fervently believed that Parliament wanted to establish a subservient military force that could respond to the growing number of civil disturbances, like the Boston Tea Party. For example, the Connecticut Courant published a letter, supposedly written from a Gentleman in London, on August 23rd, 1774; which exclaimed, “The real design of the Quebec Bill… is to make it a military government, by way of check to several provincial assemblies and proprietary rights of the other provinces on the continent.” In the minds of the American’s, it explained the decision to expand Quebec south because it would allow an army to reach any colony on short notice. 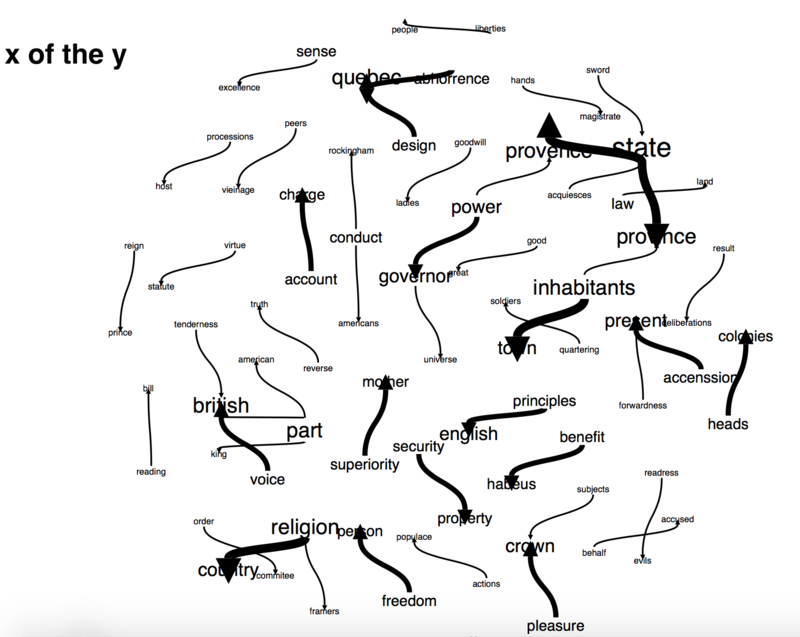 The word cloud also illustrates the importance of the individual. 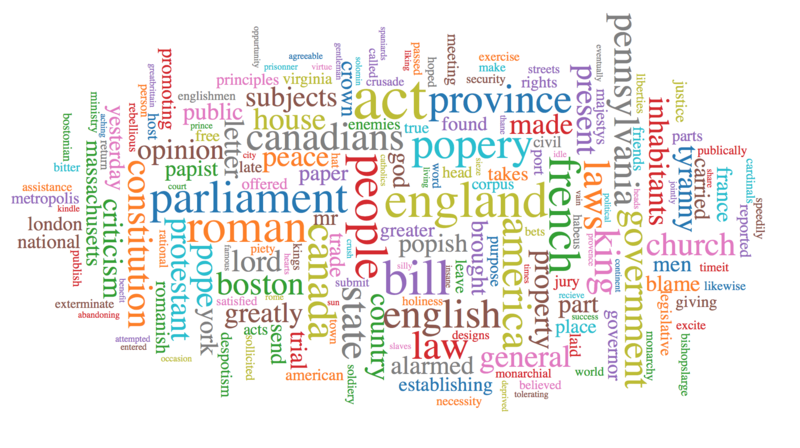 Notice how the “people” is larger and more centralized than “state,” “country,” “government,” and “King.” Although the importance of individual rights had been crucial to the development of the English nation, this was a quintessentially Protestant-American notion. The majority of Anglo-Canadian’s complaints about the Quebec Act were not motivated by theology or nationalism. They were concerned with the status of their personal freedoms guaranteed by the Protestant, English Constitution. The phrase net vividly illustrates this. The phrase net also highlights the most controversial revocations of English rights through the replacement of English Common law with French law. In particular, “benefit (of the) Habeas (Corpus), “freedom (of the) person,” and “security (of the) property.” The imposition of Catholicism, and thus French law, meant that citizens could have their property seized by the church-state apparatus due to their reestablished right to demand tithes. Not only could an individual no longer challenge such a seizure in court, but an individual could now be imprisoned without trial. However, it is important to note that the erosion of individual rights was continent wide. The Royal government enforced other notorious acts, referred to collectively as the Intolerable Acts. For example, the Administration of Justice Act stripped colonists of their right to fair trial by their peers, forcing the accused to stand trial in Britain. Although the colonists had reservations regarding independence, the British establishment forced the American’s hand. In times of utter desperation, people make drastic decisions. One only needs to examine the current election cycle to observe this phenomenon. The majority of Americans are bewildered. For years, Americans have been electing their preferred candidates to Washington, only for them to be corrupted by the political establishment. This problem is the ultimate catch-22, because any politicians selected to replace the out-of-touch politicians are then corrupted themselves. This frustration was compounded by the miseries of the Great Recession. Now disillusioned voters are turning to options that would have been laughable candidates a mere four years ago; choices that include a socialist (Sanders), a neo-fascist (Trump) and a dominionist (Cruz). This desperation caused by a fervent hatred of the political establishment is eerily similar to the pre-revolution American Colonies. Creviston, Vernon P. “”No King Unless It Be a Constitutional King”: Rethinking the Place of the Quebec Act in the Coming of the American Revolution.” The Historian 73.3 (2011): 463+. Fenton, Elizabeth. “Birth of a Protestant Nation: Catholic Canadians, Religious Pluralism, and National Unity in the Early U.S. Republic.” Early American Literature 41.1 (2006): 29-57. Milobar, David. “Quebec Reform, the British Constitution and the Atlantic Empire: 1774–1775.” Parliamentary History 14.1 (1995): 65-88. Rhoades, Matthew L. “Blood and Boundaries: Virginia Backcountry Violence and the Origins of the Quebec Act, 1758-1775.” West Virginia History: A Journal of Regional Studies 3.2 (2009): 1-22.